On the heels of the much publicized passing of Dusty Rhodes, wrestling has lost another name from the 80s and 90s in “Nature Boy” Buddy Landel who has passed away at the age of 53. Landel (real name William Ansor) made a name for himself mainly in the Memphis and NWA areas, where he wasn’t the only bleached blonde “Nature Boy;” in fact, Landel had numerous matches with Ric Flair in the 80s and early 90s that were dubbed the “Battle of the Nature Boys.” Landel was actually managed by famed Horseman manager J.J. Dillon against Flair before Dillon ended up by Flair’s side for the majority of Flair’s famed NWA run. 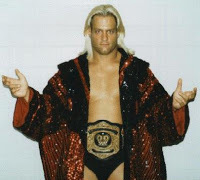 Landel worked for Smokey Mountain Wrestling during the mid-90s; the company had a working agreement with WWE at the time which allowed Landel to even work with then-Intercontinental Champion Shawn Michaels at a Smoky Mountain show. In the mid-90s Landel briefly wound up in WWE, having notable matches against Bret Hart and Ahmed Johnson before a knee injury ended his run. Landel would be seen again in WWE as late as 1999 as he even had a match with Triple H.
Buddy Landel was largely considered a top in-ring wrestler who had potential to be a main event star, but was also held down by personal issues that seemed to pop up just as he would once again climb the ranks of a given promotion. Regardless of his issues, Buddy was a bit of a journeyman that had some great matches wherever he went over the years that are definitely worth going back and watching. Yamma Pit Fighting Debuts This Weekend, Bringing Back Old Style UFC.